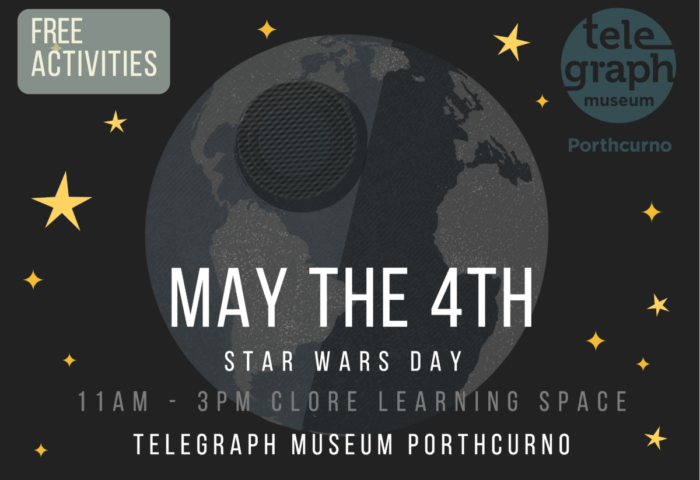 Telegraph Museum Porthcurno is celebrating MAY THE 4TH ‘Star Wars Day’ with exciting digital activities for all themed around space exploration and digital futures. We are teaming up with Penwith College, Software Cornwall, Digital Peninsula Network, Falmouth Games Academy and Cornwall Film Festival to raise awareness for digital opportunities at the museum and digital careers across Cornwall. In 1967 Cable and Wireless commissioned a film titled ‘Apollo in Ascension’ profiling their involvement with the Apollo programme. Ascension Island was the location of the C&W earth station which helped transmit communications data for the NASA Apollo moon mission. The 30-minute film documents the installation of the satellite communications station as well as the vast, unearthly landscape found on Ascension. We will be projecting a digitised version of the 35mm film throughout the day. Talk to our local partners about training opportunities and find out how you can develop your digital career in Cornwall. Take part in digital activities such as programming Micro:bits and Raspberry Pi’s. Museum staff will be on hand to talk about adult volunteering in digitisation, our Young Curators programme and our digital engagement and learning activities for young people that run throughout the year. Our Clore Learning Space is located opposite the museum car park.